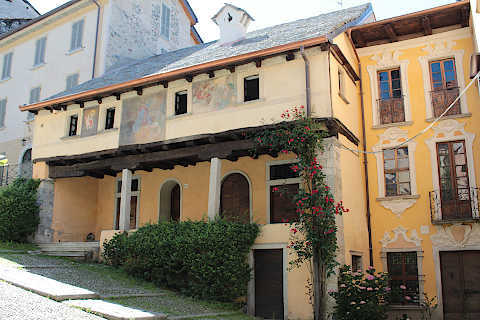 The village of Orta San Giulio is on the east shores of Lake Orta, in the Piedmont region (Novara province) of north-west Italy. 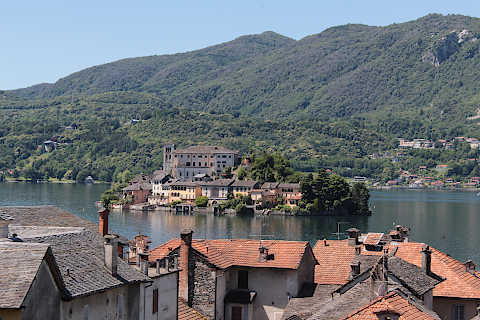 Italy This Way comment: although Lake Orta is slightly less accessible than the other important lakes in northern Italy, the lake - and in particular the village of Orta San Giulio - is picturesque and is an attractive excursion from Lake Maggiore to the east. 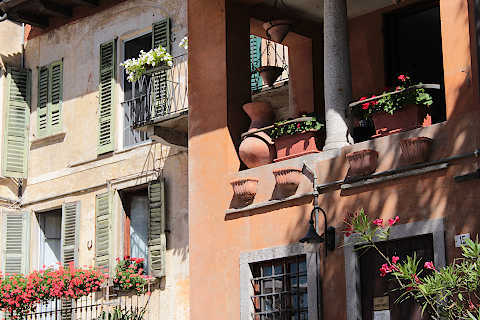 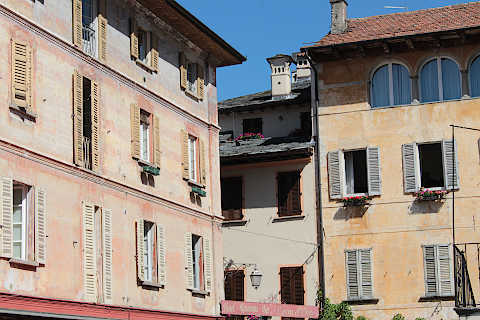 As you start to explore, you quickly find yourself in the narrow streets of tall, colourful houses in the historic centre of Orta San Giulio, which are attractive although sometimes rather dilapidated! 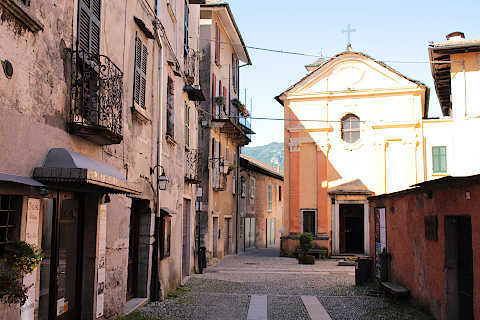 At the end of the main street into the village (Via Antonio Professor Poli) you pass a small church with a baroque style facade painted orange. 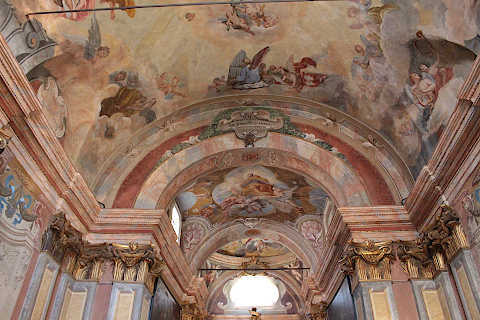 Enter this church to see the colourful interior: the walls and columns are painted orange and red and the ceiling painted with frescoes. 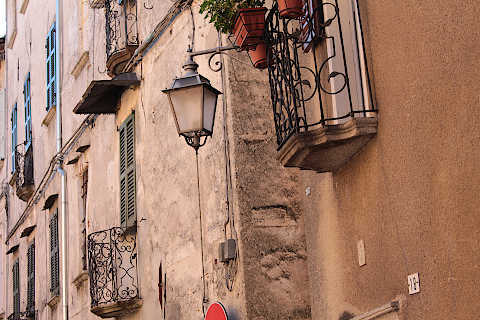 From here you can follow the narrow street (Via Bossa and Via Olina), a charming historic street of shops and restaurants. 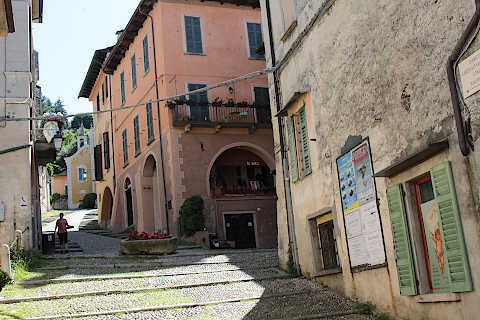 You soon reach the main square in the town, the Piazza Motta. 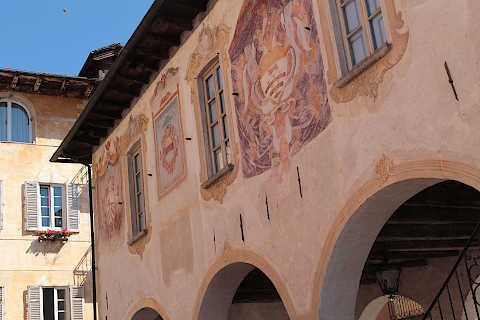 The building at the entrance to the square is one of the most important historic monuments in Orta San Giulio, the 16th century town hall with its arcades and frescoed exterior. 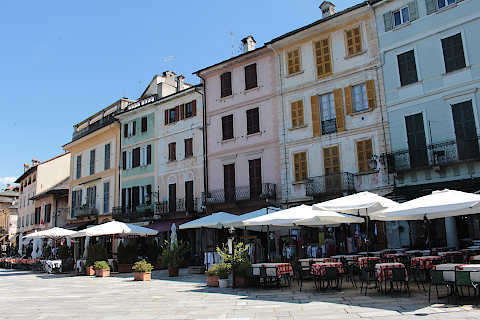 The Piazza Motta is a very lovely square, with cafes along one side and Lake Orta along the other side, and beautiful views across to Isola San Giulio, the village on an island in the lake. 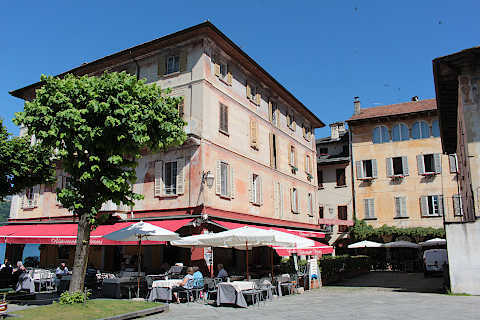 You will certainly want to enjoy a coffee or a gelato here! 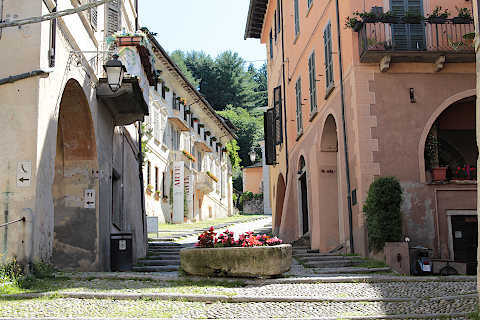 After exploring the square, return to the corner near the historic town hall and just outside the square you can see a path, the Via Caire Albertoletti, that leads up the hill to a church. 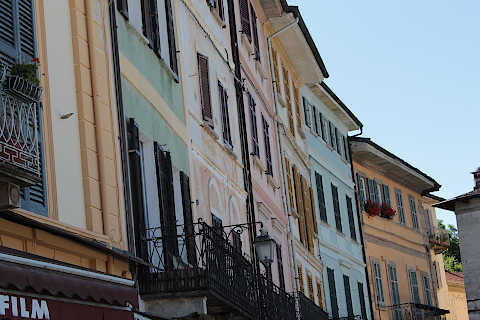 This is one of the most attractive streets in the village centre with imposing houses on both sides. 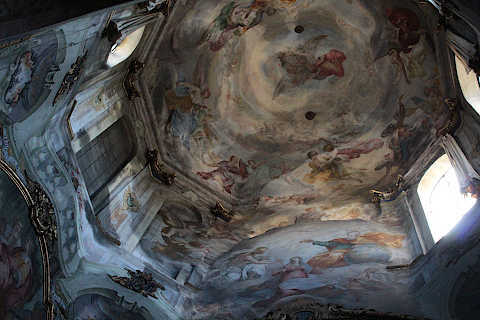 At the top of the path you reach the 15th century Church of Santa Maria Asunta, a baroque style church that contains numerous paintings and frecoes, including a painted dome. 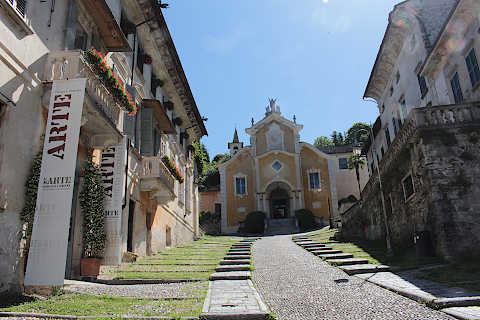 From the church another path meanders up the hill to the sanctuary of Sacro Monte: the path to the sanctuary has some especially good views across the lake, and passes 21 chapels along the way, some of them imposing small chapels in the classical style. 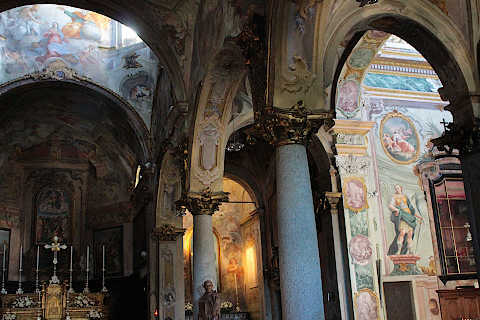 The sanctuary is dedicated to Saint Francis of Assisi. 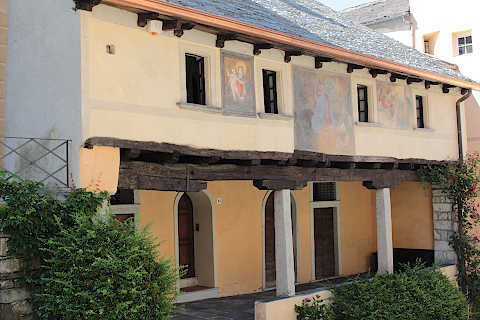 The Sacre Monte is now listed as a UNESCO world heritage site. 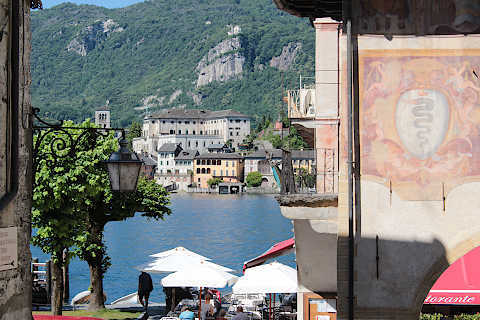 Coming back down the hill from the church or sanctuary you have more nice views across the lake. 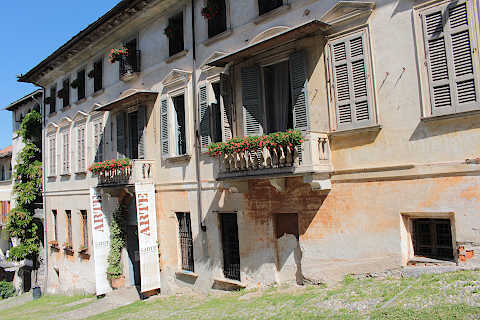 After exploring Orta San Giulio village and descending back to the shores of Lake Orta you can follow a path along the shores of the lake from the village.